I first heard this particular piece of music by Claude Debussy (1862-1918) through Ken Russell’s biopic of the composer, The Debussy Film (1965). It stars Oliver Reed as an actor playing Debussy in a film about the composer’s life — a most ‘meta’ plot. Pre-Raphaelite fans will know Russell’s other film from the 1960s, Dante’s Inferno: The Private Life of Dante Gabriel Rossetti, Poet and Painter, released in 1967 and once again with Reed at its heart. The genesis of this Rossetti film can be seen in The Debussy Film, in a scene filmed at Tate Britain explaining the influence of Pre-Raphaelite and Symbolist poetry and painting — both from England and France — on Debussy’s music (clip below). Russell introduces the lovely La damoiselle élue in this scene by playing it over a medley of Pre-Raphaelite images, from the 1875-9 version of Rossetti’s The Blessed Damozel, to Burne-Jones’s King Cophetua and The Golden Stairs, Millais’s The Knight Errant and Rossetti’s women of the 1860s. These paintings date from the later stages of Pre-Raphaelitism, after it had merged into the Aesthetic Movement; the famed ideals of art aspiring to the condition of music, which are often seen as fundamental to Aestheticism, were espoused in the writings of Walter Pater in England and Charles Baudelaire in France. Indeed, Debussy even set five of Baudelaire’s poems to music in the late 1880s, at around the same time he composed La damoiselle. Dante Gabriel Rossetti, The Blessed Damozel, 1871-9. Oil on canvas, 111 x 82.7 cm. Lady Lever Art Gallery, Liverpool. 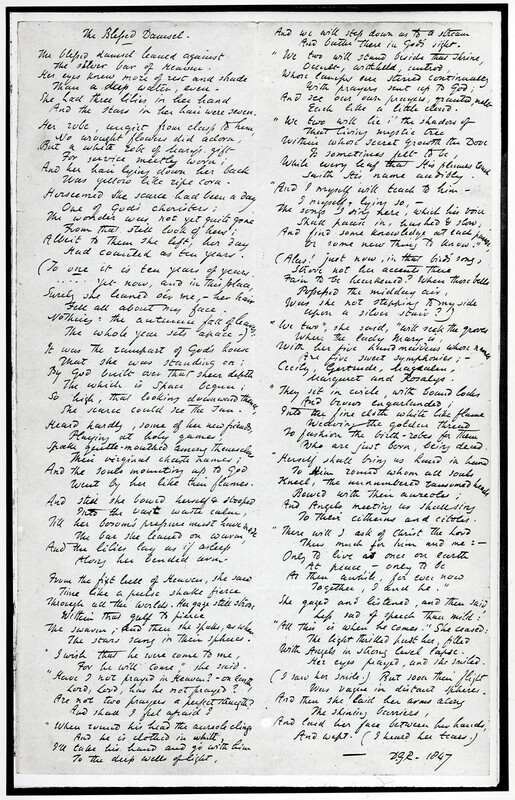 Fair copy manuscript of ‘The Blessed Damozel’, copied out by Rossetti and given to Elizabeth Barrett and Robert Browning in 1855. Morgan Library, New York / Rossetti Archive. I discussed Rossetti’s first painted version of The Blessed Damozel (now in the Fogg Art Museum at Harvard), and its relationship to his poem of the same name, in a previous post. It is interesting to consider, then, that Debussy’s La damoiselle élue can be doubly associated with both a painting and a poem, creating a kind of triangular relationship between three works of art by two different artists. According to Caroline Rae, however, Debussy is unlikely to have seen the original Blessed Damozel painting in person (I’m not sure if reproductions of Rossetti’s paintings were in circulation on the Continent at this time). Debussy probably read a French translation of Rossetti’s ‘Damozel’ in a newly published anthology of English poetry, Poètes modernes d’Angleterre (1883), translated by Gabriel Sarrazin. Using Sarrazin’s text as the libretto, he composed La damoiselle élue from 1887-8; it was published in 1893, and first performed at the Société nationale in Paris in April that year. 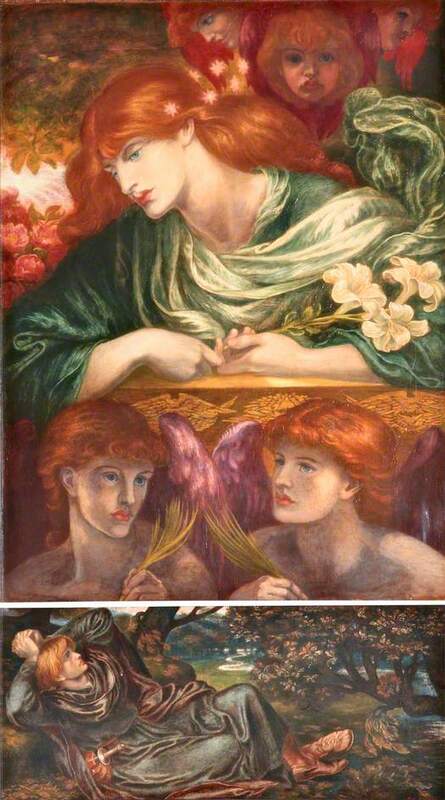 The opening notes of the piece beautifully evoke Rossetti’s image of the Damozel leaning out on the gold bar of heaven, her eyes deeper than the depth of waters stilled at even, with three lilies in hand and seven stars in her flowing hair ‘yellow like ripe corn.’ With the introduction of rising wind instruments, layered over the strings, comes the suggestion of looking heavenwards and seeing the heavenly lady in her place. The same effect is had when one stands before the painting, placed slightly above eye level like an altarpiece. This is followed by a heavenly chorus of female voices, echoing Rossetti’s lines ‘Her seemed she scarce had been a day / One of God’s choristers,’ as well as the angel attendants surrounding the Damozel in his painting. 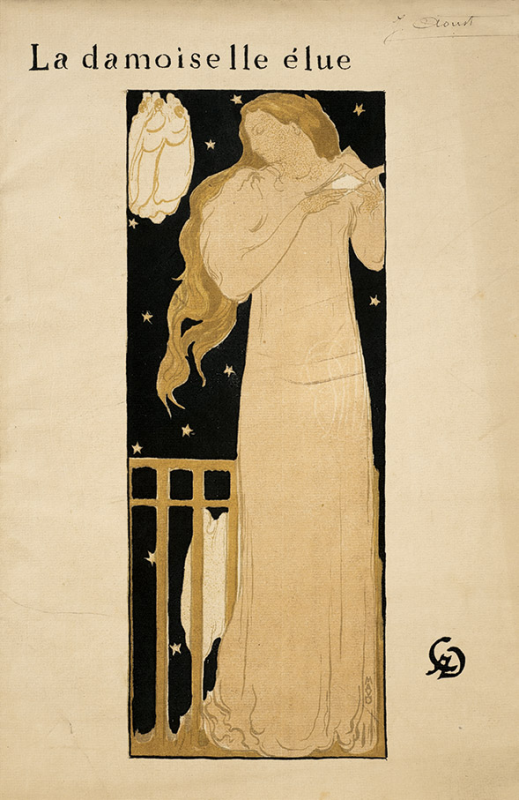 Maurice Denis, frontispiece to the score of Debussy’s La damoiselle élue, published 1893. It’s only a shame that Rossetti himself had died in 1883, and so would never have heard the music his art and poetry inspired.